Grassy Narrows First Nations will soon release a ground-breaking new report in Ottawa. The authoritative report is the first study to link higher rates of health and wellbeing challenges in Grassy Narrows’ children with exposure to mercury, a potent neurotoxin, from local fish. Grassy Narrows has long asserted that the mercury poisoning of the English Wabigoon river system in Northern Ontario continues to impact new generations of their children, and are calling upon Prime MInister Trudeau to take action. Please share even if you are not in Ottawa! Grassy Narrows’ children and youth are a national inspiration as leaders in the movements for environmental justice and Indigenous sovereignty. They have led Canada’s longest standing Indigenous logging blockade, walked thousands of kilometers for water protection, and led marches of thousands in Toronto for mercury justice. They have also created a hit song “Home to me” with over a million views, written award winning plays, and become accomplished nurses, teachers, powwow dancers, artists and athletes. This report documents the unique headwinds that these remarkable youth face to succeeding in a community enduring an ongoing four decade long mercury poisoning crisis. The authors write that “[t]he legacy of mercury compounds and exacerbates the legacies of colonialism and residential schools on the health and well being of the next generation.” The report makes key recommendations for urgent actions needed to improve the health and well being of Grassy Narrows’ children and youth so that all can reach their full potential. 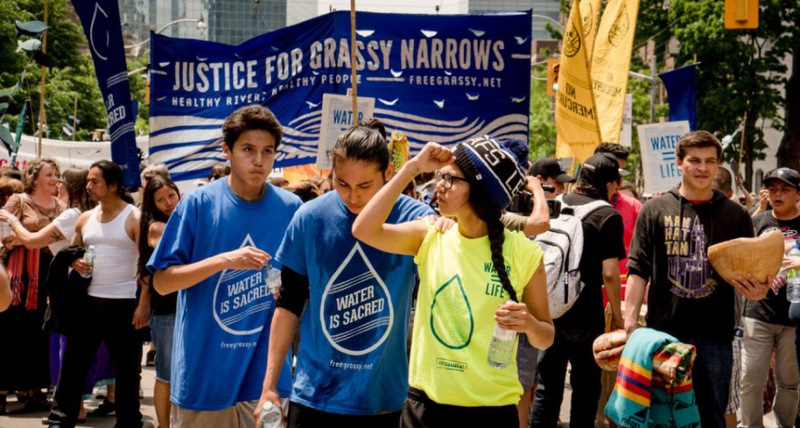 Please join Grassy Narrows to call for Mercury Justice! 12pm, December 6, Parliament Hill Centennial Flame.